Over the past 12 years millions of people around the world have been growing or wearing real or fake moustaches for Movember, an international campaign that aims to raise awareness and funds for men’s health and prostate cancer. This year Janssen EMEA is proud to continue its support for Movember by launching its own campaign for 2015: MOVEMBER MO’MENTUM – what moves you? 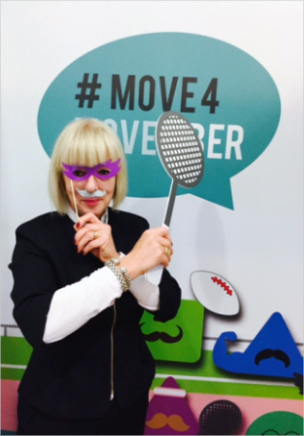 Company Group Chairman, Jane Griffiths, has also joined in the Movember fun by sharing a picture of her ‘moving’ for Movember. Latest figures show that there are currently three million men living with prostate cancer in Europe. Together with the International Movember Foundation, Janssen EMEA wants to help raise awareness of the disease in order to provide hope, strength and support to those affected by prostate cancer, as well as encourage early diagnosis. We have been overwhelmed by the enthusiasm and participation of Janssen EMEA colleagues to get mo’ving this Movember so far and we hope that there are more to come! 1 European Commission. CORDIS Express: Prevention, diagnosis and treatment of prostate cancer. Available at: http://cordis.europa.eu/news/rcn/122705_en.html. Last accessed November 2015.